My folks live in a housing development on an exposed corner lot. When they first moved in, my dad became concerned with neighborhood pets leaving little gifts on his lawn. He soon found this “tasteful” sign to ward off scofflaws. I am never sure whether this kind of thing is effective or just attracts spiteful pet owners. Fortunately for my parents, the neighbors seem to respect it. Looks like certain (cough..cough) parts of the signage could use some touch-up paint but I'm not volunteering. My folks have a sign as well - although it's not cute like this one - I think it's pretty funny. Ha! Cool sign. 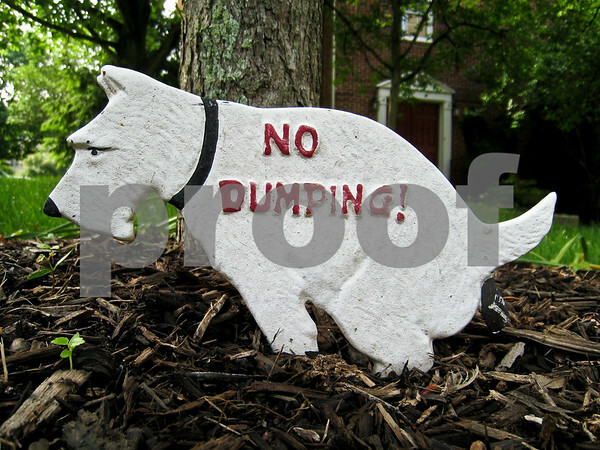 I'd laugh hard if my dad's neighbors put one of these up. His dog seems to prefer their grass for some reason. This is too funny -- love it!